송광사 응진당에는 석가여래삼존상을 비롯하여, 아난·가섭존자 그리고 16나한, 제석천, 범천, 인왕, 사자를 모두를 갖춘 27구의 상들이 봉안되어 있다. 미륵보살입상을 제외한 26구의 상들은 17세기 전라도 지역에서 활동하던 응원(應元)을 비롯한 조각승들이 조성한 상으로 알려져 있으며, 사자상(使者像) 대좌의 명문을 통해서 1624년(인조 2)에 제작되었음을 알 수 있다. 삼존상은 석가와 미륵, 제화갈라보살로 구성된 수기삼존형식으로 조선시대 삼세불상의 대표적인 도상이다. 본존상은 수종사 불감에서 발견된 15세기 금동불좌상과 같은 조선전기의 조각전통을 계승하면서 얼굴표정이 온화하고 신체가 부드럽고 양감이 강조되었으며, 전체적으로 안정감이 있어 17세기 전반기 조각으로서는 우수하다고 할 수 있다. 십육나한상들은 목심소조(木心塑造)로 제작되었는데, 지금까지 전해오는 고려와 조선전기의 16나한상 조각이 온전하게 전해지는 경우가 거의 없으며 이 송광사 16나한상들은 16존이 모두 갖춰져 있어 그 가치가 더욱 높다. A total of 27 Buddhas are enshrined at Eungjindang, one of the oldest worship halls at Songgwangsa Temple. They include a Wooden Sakyamuni Buddha Triad and Clay Sixteen Arhats, as well as other figures such as Ananda, Kasyapa, Indra, Brahma, Vajrapani and a messenger of the underworld. Except for a Maitreya image, the rest of the 26 figures were made in 1624 (the second year of King Injo’s reign), by sculptor monks who were active in the Jeolla-do Region in the 17th century, according to an inscription on the pedestal for the messenger of the underworld. The Sakyamuni Triad consists of the Buddhas of the Three Ages, that is, Sakyamuni, the historical Buddha; Maitreya, the Future Buddha; and Dipamkara, or the Lamp Bearer, one of the Buddhas of the past. 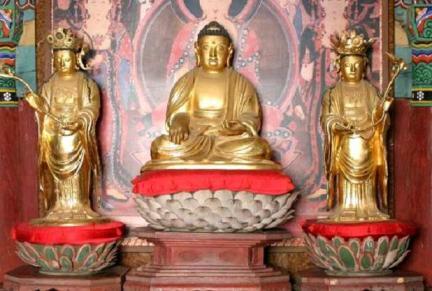 These Three Buddhas comprised the typical Sakyamuni Triad symbolic of assuring enlightenment from the Joseon Dynasty. The Sakyamuni Statue, reminiscent of a 15th century gilt-bronze image in a portable shrine discovered at Sujongsa Temple, exudes a sense of stability from its gentle face and smooth voluminous body, inheriting the early Joseon sculpture style. It displays relatively superior carving technique for a 17th-century work. The Clay Arhats, made with wooden cores, are highly valuable as the only complete set of 16 figures of the historic Buddha’s disciples handed down from the Goryeo to early Joseon Dynasty.